What an appropriate title. 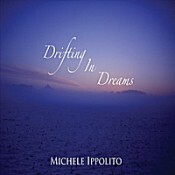 The hour it takes to glide through Michele Ippolito’s third release, Drifting in Dreams, goes by with you embraced in a warm haze of equal parts New Age and spacemusic with a lovely hint of classical. Ippolito layers in soft synth washes, harp, flute, and more to load her songs with strong emotional content and breath-slowing calm. If anything, Ippolito’s music exists closer to the spacemusic side, but with a bit of restraint. Her scenes are more intimate and immediate; she’s not guiding us to the farthest reaches, but inviting us to turn inward. Yet the work has that deep dreaminess, that sense of the voyage. Her style has the potency of a Constance Demby, but without relying on the celestial trappings. “Ship Ahoy” takes us as far as any starfaring synth track, and carries a waft of aching melancholy that cuts through the misty wall of sound around it. It’s a very touching piece. “Reaching for the Stars” starts off feeling a little sweet, but soon melts into another reflective set of washes. Keyboard notes twinkle in the background. There’s a lot to like here. “Mystical Forest” takes a repeating phrase on keyboard and intertwines it through long pads and breathy flute tones. Ippolito makes excellent use of subdued percussion on “Midnight Moonlight Trance,” building in a bit of mystery and tension, along with just a touch of the tribal. The beat nicely breaks up the long flows on either side of it. “Across Still Waters” is another flute-led piece that courses along on warm synth pads. This is one that’s quite easy to get lost in as Ippolito whispers her story in your ears. There are a few points on the disc that get almost too standard-meme New Age-y for my tastes, but Ippolito never veers too far toward the sugary side of the equation. The depth of emotion and the slow, sure pace keep things strong. The work is solid throughout. Drifting in Dreams is very much an end-of-day, low-volume kind of disc. There’s no way to deny its simple, subliminal call for you to relax. It has a definite grace and allure, and it stands up nicely to a close listen. A strong release for New Age fans that will also appeal to anyone who just enjoys good, quiet music aimed at helping you unwind.